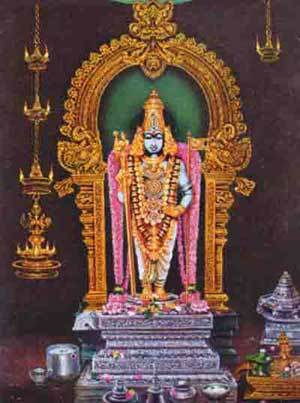 Arulmigu Dandayudhapani Swami Devasthanam - Palani. Palani is one of the most visited and popular temple in Tamilnadu dedicated to Lord Muruga and is one of the revered 6 Padai Veedu shrines of Murugan. The temple of Dhandayudhapani is located atop the Palani hills, which is about 324 metres above the sea level. 690 stone steps line the mountain passage and an electric winch and cable cares also takes pilgrims up the hill. Once you reach the top of the hill, you need to take several rounds towards temple to get the blessings from Lord Murugan. Once you came out from the main shrine, you will see the golden top of the main temple. Before get down, you should look around and see the nice view of Palani and nearby areas. In addition, you can get the excellent view of Kodaikanal hills and near by Idumban hills. 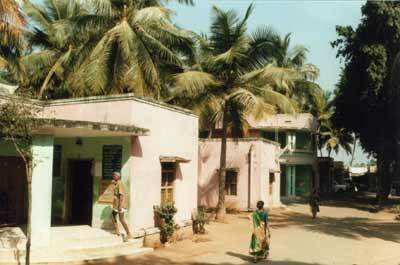 Poet Nakkerar has sung about this temple in Thirumurugaatrupadai. 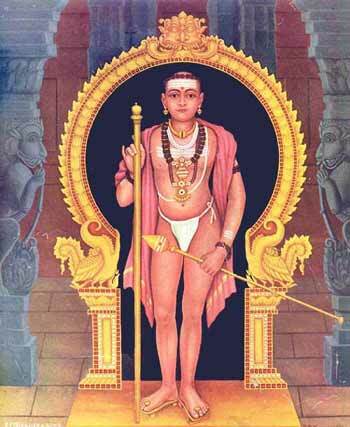 In his Thiruppugazh, Saint poet Arunagirinadhar has composed many verses about the Palani temple. The structure of the temple is such that Tiruvavinankudi temple is located at the foot of the hill while the Palani Andavar is located on top. The Tiru aavinankudi temple is also known as Kuzhandai velayudhar temple. The waters of Saravanapoigai is located beside this. The main deity at this temple is known as ‘Dhandayudhapaani’, called so due to the staff (dhandam) he holds in his hand. He is clothed like an ‘aandi’ in this sthalam, so different from the others where he is seen in his regal splendour. 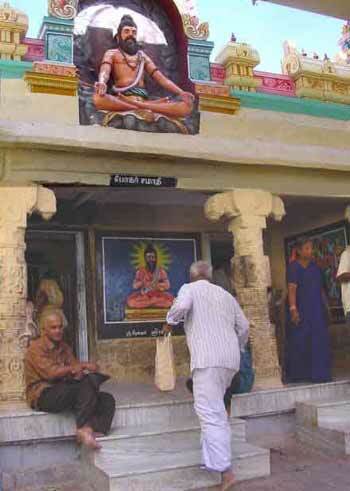 The legend behind the Palani temple is very famous. One day, when all was well in Mount Kailash, the sage Naradha went to pay his respects to the Destroyer. He had with him the ‘nyana pazham’ or the fruit of knowledge. When he offered it to Shiva, who in turn offered it to his offspring, there arose the question as to who would have it – Ganesha or Skanda. 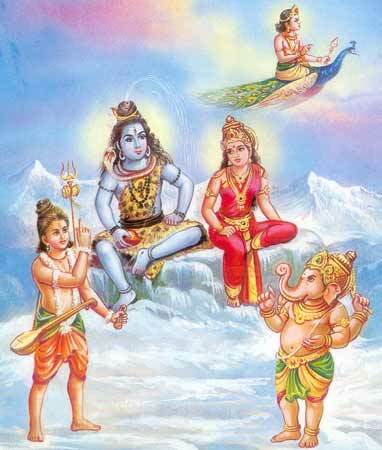 To help them arrive at a decision, Shiva and Parvati said that whoever circumbulates the universe and reaches them first will be declared the winner. The minute these words were uttered, Lord Subramanya jumped on his vahana, the peacock to go around the Universe. Lord Ganesha thought for a minute and circumambulated around his parents. Thus declaring that they are the Universe. His delighted parents gave the fruit to him when Lord Muruga reached Mount Kailash after finishing his round. Seeing that he has been defeated made the young God angry and he left his parents and settled in Palani. 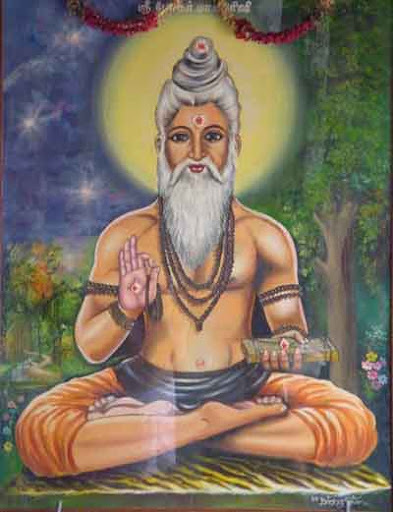 He denounced all his riches, including his grand clothes – which explains the aandi pose at Palani. Another legend attached to this temple is based on Sage Agasthiyar. Lord Shiva presented the holy sage with two mountain peaks, Shivagiri and Shaktigiri. Agasthiyar bade his disciple Idumban to carry the two hills. To make this easier, Idumban joined the two hills by means of a pole and carried it over his shoulders. When he came near Palani, he was exhausted and took a moment of rest. While doing so, he kept his load down. At this, the hills got stuck to the ground. 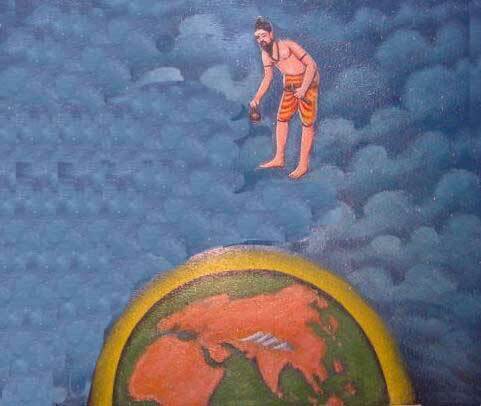 While he tried to shift them, Lord Muruga, who was atop one of these hills, fought with Idumban and killed him. But Sage Agasthiyar implored the Imperial Commander to restore Idumban back to life. Lord Muruga agreed to this and gave life to Idumban, who wished to be a dwara palagan at the temple at Palani. Lord Muruga granted his wish. 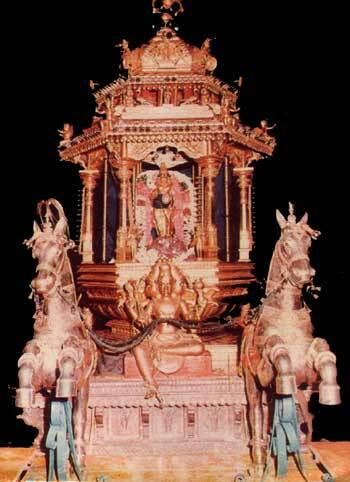 The way in which Idumban carried his load is said to be the origin of the kavadi worship. Idumban, is said to be the first Kavadi bearer. Pujas are done at seven times in a day at the Palani temple. The first service of the day is the Viswa roopa darisanam. The last pooja includes a procession of the uthsavar in a golden palanquin around the temple and the palli arai sevai. Daily Following Poojas will be held. Darshan (meaning open to the public) hours are from 6.00 a.m. to 8.00 p.m. On festival days the temple opens at 4.30 a.m.
Golden car procession starts at 6.30 p.m. and ends around 7.30 p.m. Those who want to sponsor the same can contact the Devasthanam office (kindly avoid brokers/agents). *Golden Chariot: NO procession of the Golden Chariot will be conducted on Thai Poosam, Panguni Uthiram , Navarathiri, Soora Samharam and Karttikai Deepam days. Fees can be paid on the same day of Golden Chariot procession. Bogar is a Siddhar, he is considered as one of the 18 siddhars born in the world. According to epigraphical sources and his book Bogar Seven thousand his period is around 3000 B.C. Bogar born at India and visited China in search of truth of life, he gained knowledge in medicine, astrology, spritiuality, yoga etc. Bogar anticipating that in due course of period, human beings will suffer from large number of disease. As an expert in medicine he used 4448 rare herbs and made 9 poisonous medicine, mixing these 9 poisons into one needs great knowledege and skill, to make a Master Medicine ( One medicine to cure all disease ). Thirumoolar also discuss one such Master Medicine in his book Thiru Mandiram. 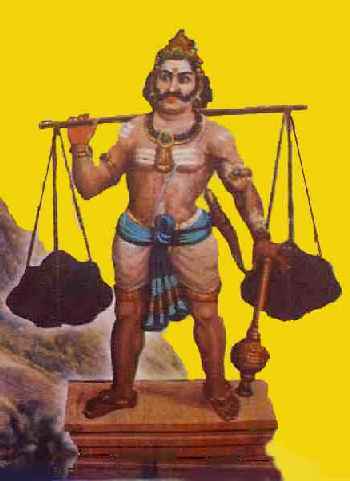 With the consultation of Agasthiar ( Father of Ayurvedic Medicine) and other siddhars Bogar mixed the 9 poisons ( Nava Bashanam ) and made the Master Medicine in the form of Lord Murugan which is currently worshiped at Palani Murugan temple. There is a place near Palani Hill called Thanasiappan Temple which is the place were Bogar mixed the Nava Bashanam and made the Murugan idol. Bogar and others then decided that by using the milk and panchamirtham ( a sweet recipe ) poured on the idol, one can extract the medicine from the idol. The milk and panchamritham then becomes medicine to cure disease. 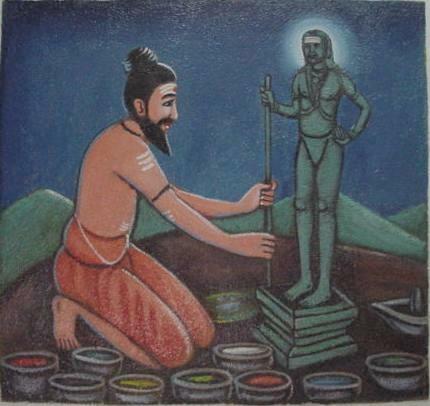 After installing Lord Murugan Navabashana idol at the Palani Hill, Bogar used to worship it with milk abishegam ( pouring milk on the idol ) and panchamirtha abishegam ( pouring panchamirtham on the idol ). His disciple Pulipani siddhar then took over the job of Lord Murugan pooja after Bogar went into Nirvigalpa Samadhi - the highest samadhi stage; where the Mind dissolves with Matter and Energy. Bogar Samadhi is inside Palani Murugan temple at Palani Hill. Actually Bogar himself constructed his samadhi exactly under the Lord Murugan Navabasha idol and went into Nirvigalpa Samadhi there. The entrance to his samadhi is a cave like structure, now also worship for this great siddhar is conducted at this entrance where he is last seen by his disciples which is at the Palani temple. No pilgrim should fail to mark attendance at the shrine of Bhogar in the southwestern corridor of the temple. He it was who created the navabhashana image and consecrated the deity. The deity of Palani is known as Dandayudhapani Swami, the Lord having the Staff in his Hand. The deity at the sanctum sanctorum is made out of an amalgam of nine minerals popularly called Navapashanam. Some people say it is a combination of medicinal herbs. The deity is in a standing position with a baton in his hand. He has the look of a person who has renounced all worldly pomp. He has just a loincloth besides the baton. He is a mute messenger of the great precept 'Renounce all to reach Me'. The icon is unique in the whole world. It was made by siddha Bhogar by combining nine poisonous substances (Navapashanam). Murugan signifies beauty and Lord Murugan of Kurinji land is the god of Beauty and Youth. Lord Muruga is Abhisekapriya (fond of anointment), especially Pañchamirta (fruit jam having medicinal properties). The Devasthanam prepares pañchamirta, vibhuti and other items which are sold for reasonable price. Like Pañchamirta, the Rakkala Sandanam (sandal paste placed on the deity during the night) has special significance and sanctity. The old, the sick, the weak and the handicapped persons used to be carried to the hill-top by human beings in 'dholi' (palanquins or chairs). For this type of lifting people up, the pandarams worked in two sets; the first set (of two persons) carrying the dholi up to a central point 225 feet high and the second set relieving them at that stage. This mode of human beings helping to transport the devotees is no longer in vogue, thanks to modern technology. In 1966, the Devasthânam commissioned a haulage winch (weight 22 tons) with a carrying capacity of 36 persons. It is hauled up over a railway line running to a length of 290 metres (960 ft.) as against the hill height of 450 ft or 136 metres. The travel time is 480 seconds. A special steel rope is wound during the ascent and unwound during the descent by an electrically rotated drum. The rope is frequently lubricated and periodically examined for safety. The Devasthânam has arrangements with the Kundah Project in the Nilgiris for regular servicing of the winch by competent engineers. At the quarterly inspection, the rope is examined for wear and tear, cuts, corrosion and other defects. The diameter at every 50 ft. of the rope is taken and compared with the previous readings. Once in six months, the holder is removed and a new one jointed. The rope is tested for tension. Annually the rope is replaced. During such occasions for a day or two, only one winch is operated. A generator has been purchased and so power failure does not affect the working of the winch. The winch service operates from 5 am to 9 pm. On Karttikai and festival days, the service starts at 4 am and goes on till 10 pm. A nominal fare is charged for one way and for return trips. In 1981, a second winch was put up at a cost of Rs. 18.5 lakhs and since then, one winch is hauled up and the other hauled down. The Hundial is the cash collection box. It is the backbone of the economy of the temple. Palani Dandayudhapani Swami Devasthanam has the honour of being the temple of highest income in Tamil Nadu and second only in all India after Tirupati. Giving annadanam at the hill temple at 12:30 pm is a useful scheme for the benefit of the devotees. If a donor deposits Rs 25,000, the interest of it will be utilised for annadanam on a particular day as per the request of the donor. Tonsure ceremony is a special feature of Palani. Many devotees of all ages perform tonsure ceremony at Palani. Tiruvavinankudi, Periyanagaki Amman temple, Shanmuganadhi group of temples, Idumban Hills, Vishnu temple, Pada Vinayagar temple, 108 Vinayagar shrines around the hill temple, the Kuriñjiandawar temple (Kodaikkanal), the Velappar temple aat Poomparai (Kodaikkanal) are the important constituent temples adminstered by Palani Dandayudhapani Swami Devasthanam. This temple is under the control of the Hindu Religious and Charitable Endowments Department of the Government of Tamil Nadu. There is a Joint Commissioner/Executive Officer to look after the day-to-day administration of Palani temples. He works in close association with the Chairman, Board of Trustees and other members. Pilgrims have plenty of convenient accomodation facilties around Temple. Palani Dhandayuthapani Devasthanam is doing a lot of social and maintenance work in and around Palani. They run Hospitals, Colleges, Orphanages and Lodging Houses. Here are their lodging house list. 1. 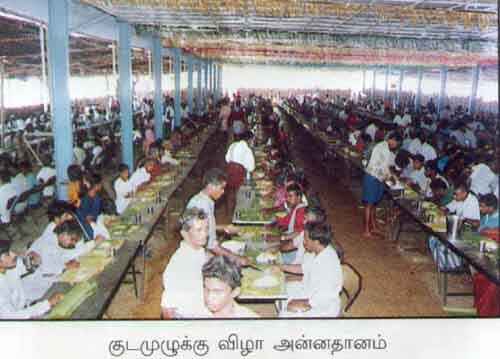 Dhandapani Nilayam (phone 04545-242325). Tariff: A/C: Rs 500 | 1st Class Delux: Rs 200 | 1st Class: Rs 150 | Economy rooms: Rs 60. 2. Cottages (Ph No 04545-242493). 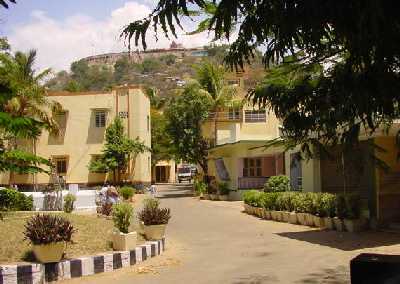 In the Giriveethi (Circumference of the holy hill) near the Administrative office of the Palani Temple there are 62 cottages are available and the tariffs are ranging from Rs 120 to Rs 500. Panchamirtam, vibhuti, souvenirs of Murugan, toys, handicrafts, pictures of the Lord and publications of the Devasthanam are among the souvenirs one can bring home from Palani. Palani is located at the district of Madurai about 112km from Madurai and 152km from Trichi. The shrine of lord Arulmigu dandayudhapani swami is at the top of the hill nearly 500feet high, but there are several god and goddess surrounding the hill itself. Devotees reach the shrine either by climbing the fight of the steps or travel by the winches. The nearest air port is in Coimbatore. Coimbatore has has regular flights from Ahmedabad, Bangalore, Calicut, Chennai, Cochin, Hyderabad, Mumbai, New Delhi and Sharjah. Air Sahara, Indian Airlines, Air Deccan and Jet Airways operate flights out of Coimbatore Airport. Palani is approximately 100 kilometers from the Coimbatore. Mode of transport from the Coimbatore to the Palani includes taxi, bus and train. Trains to Palani are available from Podanur (Coimbatore), Palakkad and Dindigul. The Murugan Temple is about 2 km from the railway station and can be reached by autorickshaw or bus. The state transport corporation and a lot of private bus operators ply bus from Palani to major cities in Tamil Nadu (Chennai, Coimbatore, Madurai, Tuticorin etc) and also to the neighboring Kerala(Palakkadu, Kochin). You have direct buses to Palani from bangalore, if u can't get one, just get any buses to Nagercoil, Tirunelveli, etc., and get down at Dindigul and it is 1 hr journey from there. Kodaikkanal is 64 KM away on the South of Palani. 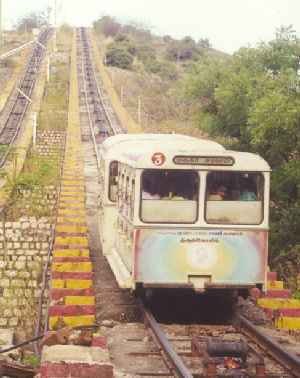 On this Route - the Distance from Bangalore to Palani Hills is 437 km.